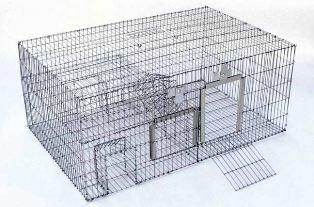 Trap Dimensions: 24" long x16" x10"
Safely catch up to 60 small birds in this unique trap. Two repeating funnel style entry doors into trap lobby. Two side hinged unloading doors with separate locking mechanisms and a third funnel door leading to main holding compartment. Door liner on parameter of unloading doors for hand and arm protection.